I love the Greek Myths. When I started taking Latin in 6th grade, my favorite thing to do was match up the Roman god with his/her Greek equivalent. Power to The Classics Nerds! Great job w/ Em. I hope I can impart a similar love and appreciation. I read your blog regularly, but have never commented. I just had to this time. Who cares about winning sporting events or doing math in your head? You've given your daughter an amazing gift...a place where she can dream and grow. I know - my mother did the same for me. That's awesome! I loved the Greek and Roman myths when I was a kid. It's great that your daughter is so imaginative. A love of reading is one of the best gifts you can give a child. Oh Dawn, I so feel your pride. I was a mytholgy lover too as a kid, and just fascinated by the goddesses (no coincidence my daughter is named for a muse). I can only hope one day to be able to write a similar thing about my own girls. May her imagination take her everywhere. 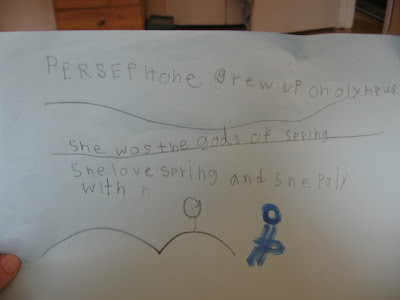 I love when kids write and illustrate their own stories. That's a great job she did there! 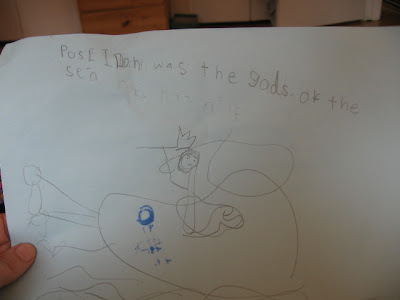 I love that she can spell Poseidon.